Multi-Chess Engine Interface Pre Loaded with 9 of the Worlds Strongest Engines. 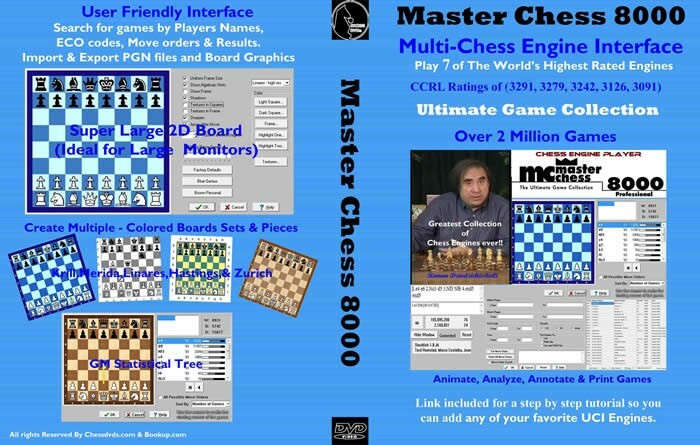 Add any Uci Engine, contains 2 million games, Animate, Analyze, Annotate, Print Games, GM Statistical Tree, Search for games, by names,eco, move order & results, Import & Export Pgn and Large Screen graphics ideal for large monitors and multiple colored boards & pieces Engines Stockfish 3291, Rybka 3126, Spark 3091 and lots More it can even Play Houdini. A bit dated, but works with the Chess Opening Wizard from. Bookup. com. Mike. from. Bookup. even. provides. an import. tool. for COW user. Excellent training tools with a lot of functions in the program to improve your play. Great package with video lessons etc.